There's no slowing down Rihanna! She's about to drop her seventh studio album in November, with a new single coming perhaps as early as next week, according to a report by Idolator, which discovered the details by way of an accidental leak from RiRi's French record label. screenshot. 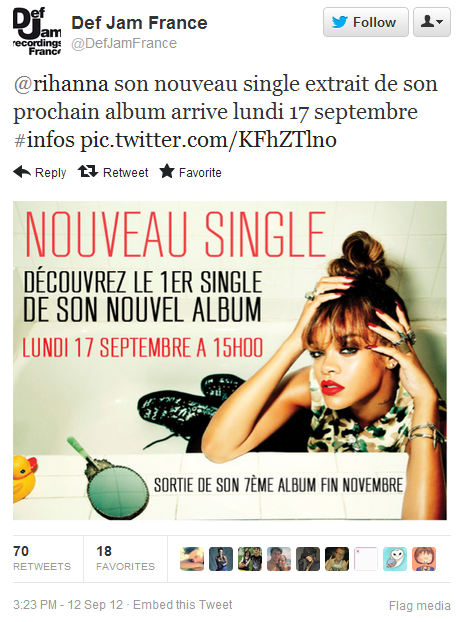 That tweet was replaced with this one, which translates as, "
New announcement this Thursday about Rihanna on our account." Previous reports suggested RiRi was working with Swedish House Mafia and with Calvin Harris associate Burns on the record. Amazingly, none of those records charted higher than No. 3, probably because November is typically the busiest month of the year when it comes to new album releases, so competition is fierce. A No. 1 album is one of the few accomplishments RiRi has yet to accomplish in her career. Maybe her seventh studio effort will be the one that finally takes her to the top.